Soldiers Magazine is an official publication of the United States Army. In 1970, an olive-drab Army jeep cruising Akron, Ohio, highways probably turned few youngsters' heads. However, an Army jeep painted red, white and blue, sporting fluorescent "U.S. Army" letters and serial numbers, chrome rims, 16-inch tires, red vinyl seats and paratroopers silhouetted against a sunburst snapped those heads right around. "I got a lot of slack-jaw stares, laughs, and oohs and aahs," said retired Army SFC David D. Hack. "I took the jeep to fairs, schools, drag races and any other place with crowds." As an Army recruiter in Cuyahoga Falls, Ohio, an Akron suburb, Hack used the jeep as a way to meet young people. "As a recruiting tool the jeep was fantastic," Hack recalled. "It broke down the communication barrier between me and the young men. They wanted to see me, and during the Vietnam War not many young men wanted to see an Army recruiter. We talked about cars, girls, school activities and, of course, the Army." The "Hackmobile" worked. His recruiting station's enlistments jumped from 13 in five months to 62 in the following four months. The jeep and Hack were a twosome for two years. However, the 101st Airborne Division broke up the team in 1972 when it wanted its jeep back. About a year later, the team's other half left the recruiting business. Hack was medically retired from the Army because of problems with a Vietnam War wound. 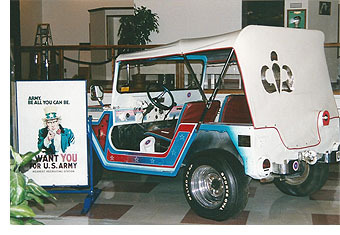 Hack never saw the jeep again, until he visited the Fort Campbell, Ky., museum last year 13 years later. "The jeep basically looked the same, but over the years the paint had chipped and the top had rotted and become tattered," Hack said. "I asked the museum's curator about refurbishing it. After a few months and several letters, I received permission to do it. "So I returned to Fort Campbell and took it back to Ohio. Because of the jeep's historical value, it couldn't get a quick repaint. So what could have taken several days took a couple of months. The body shop had to match the colors and then paint and repaint until the chips were flush with the original paint. We also replaced the top." Hack paid for the 1972 customizing and the recent refurbishing. Now that the restoration is finished, the jeep is back on display at the post's Pratt Museum. Seeing the jeep again brought back a lot of memories for Hack, especially the adventure of how he got the jeep the first time. "I thought it would be neat to customize an Army jeep and use it as a sales tool," Hack recalled, his blue eyes growing larger and his face widening into a smile. His look had just enough tease to make any young person want to take the Army challenge. "I remember calling Fort Campbell's post sergeant major and asking for a jeep. His first response was 'No way, Jose.' A couple of weeks later I called again and asked if he had changed his mind. He hadn't. I called a third time and asked when I could have my jeep." The sergeant major must have either thought Hack would keep asking until one of them PCSed, or he liked the idea of the division's name being seen by thousands of people. Hack got his jeep. "Everything was fine until the division commander saw the jeep on a newsreel about two years later. The problem was he liked the idea and wanted a similar jeep to help recruit soldiers into the 101st. The sergeant major told him the jeep was his, so he took it back. For the next three years, the jeep toured Kentucky and surrounding states promoting the 101st Airborne Div. In 1975, the Hackmobile was finally retired from the recruiting business. The jeep was returned to the division's Company D, 2nd Battalion, 503rd Infantry. "The jeep was almost lost forever," said Paul Lawson of the post museum. "The company commander had the jeep in his inventory, but couldn't drive it because of the customizing. He needed the jeep, so he was going to restore it to its olive-drab paint and standard equipment. "We found out about the problem and got him to transfer it from his inventory to the division's S-4 shop," Lawson continued. "They in turn transferred the jeep to the post's headquarters company who declared it excess and donated it to us, and we declared it historical property. "The jeep stayed in the museum on exhibition and left here only a couple of times for exhibits until Dave asked to take it back to Ohio." Seeing the jeep also brought back other memories of Hack's recruiting days. The jeep was only one of the vehicles Hack customized. Hack paid $600 for a 1960 Corvette and painted it red, white and blue with stars. He also reproduced Uncle Sam's "I want You" poster on the car. He set off the car's reupholstered bucket seats with brass Army uniform buttons. Other promotions included giving away 14,000 "I Want You" posters. Hack also added a twist by imprinting several hundred T-shirts with the poster. But instead of saying "I Want You," Uncle Sam said "Sergeant Hack Wants You." Hack gave away several hundred before a local marketing firm began selling them. Hack again paid for everything with money out of his pocket. "The jeep, Corvette, posters and T-shirts were common sense," Hack explained. "They were nothing fancy. We didn't have the flag-waving image that we have today. Back then you were making the hardest sale in the world נsomeone's life. People were saying they weren't going into the service and were going to Canada instead. "Again, they interested people enough that I could at least talk with them. For example, one guy had been called for his pre-induction draft physical. I got his name and called him up. The guy hung up on me. But when I went out to his house in the Corvette, he loosened up and eventually enlisted." Although he still encourages people to join the Army, his recruiting days are gone. "I'd be a fool if I said I didn't miss the Army. Civilian life doesn't have the bond or unity of Army life. You can't put a price on the brotherhood and fellowship in the Army. I sometimes wish I was back, but not when I visit an Army post," he said. Breaking into a laugh, he also said Army posts bring back the memories of things he didn't like about the Army, such as the long hours. Hack has still kept in touch with the Army through the Association of the United States Army. He was recently elected the president of Ohio's Buckeye Chapter, the first non-commissioned officer to hold the office. His knack for success has followed him into civilian life. "...But my family is more important to me than money." Hack's wife, son and daughter may have such a high place in his life because of his own childhood. "My father abandoned my mother, me and my three brothers in Sun Fish, Ky.," he recalled. "He dropped us off at some friends of his and said he would be right back, but he never came back." "My mother didn't know the people, and they said we couldn't stay with them. But they had a sheep house we could live in. It was a log house with a dirt floor. We used mud and grass to plug the holes. We lived there for three or four years. "My mother may have been an illiterate country woman, but she was straight up and good as gold. I learned my work ethic from her. You never forget your roots. I know what it takes to get the job done." Getting the job done sometimes meant hearing, "It'll never work, Dave." "People were always telling me that," he said, "but I did it anyway, because I believed it would work. I feel I know people and what motivates them." Knowing what intrigues people made Hack a successful recruiter and still helps him in business today. The Hackmobile, with its far-out paint and Army touches, was just one example of knowing what is needed for the times. "My wife always said I was a little ahead of my time."